with a tendency to skin irritations. 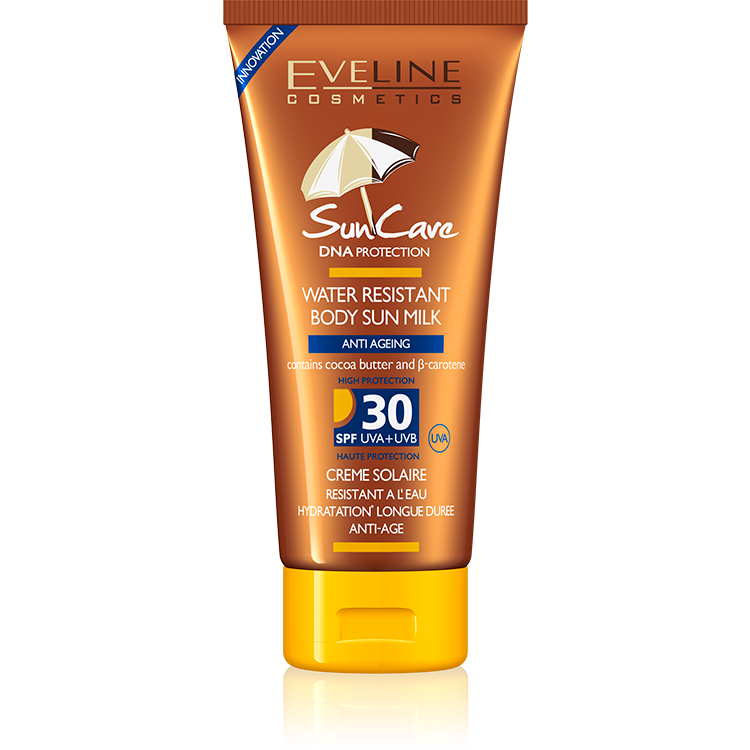 UVA and UVB filters, β-carotene, cocoa butter effectively protect sensitive skin against sun rays; provide maximum protection for the cellular DNA. D-panthenol protects against inflammations and irritations. Thanks to the new structure of the sun filters, it stimulates the skin to protect itself against shocks to the skin caused by the sun. Excellent protection against skin ageing. Vitamin E protect against free radicals and prevent premature formation of wrinkles. The skin retains its younger for longer. NMF Complex maintains an appropriate level of moisture*, elasticity of the skin and prevents it from peeling. Extracts of amber and Rhatany, β-carotene and Iuglon emphasize the tan's golden color and prolong the effects of the tan. Waterproof formula also provides protection during and after swimming and bathing. Application: Apply the milk 30 minutes before first exposure to sunlight. To assure proper protection, repeat this action several times during sunbathing (best every 2 hours). Reapplication of the product is recommended after swimming.